Rabbits have complex digestive systems that are designed to efficiently process food. Care must be taken not to disrupt the delicate balance of their intestinal flora by introducing new foods too quickly, or giving foods which are unsuitable. 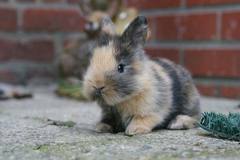 A disruption of the intestinal flora can make a rabbit very ill.
Rabbits should typically have a nutritious daily diet of hay, fresh vegetables and pellets. 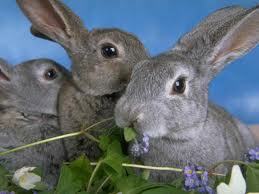 Hay and fresh greens should make up approximately 70% of your rabbits diet! Treat foods, such as fruit, should be fed sparingly. Birth to 3 weeks: mother’s milk. 3 to 4 weeks: mother’s milk, introduce alfalfa hay and alfalfa pellets. 4 to 8 weeks: mother’s milk, increase alfalfa hay and alfalfa pellets. **Please note that this is a generic dietary guideline. 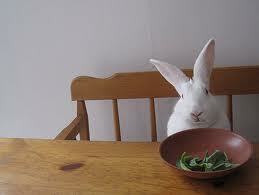 Not all rabbits will tolerate, or even like, exactly the same foods. Digestability in the Rabbit Diet -by Marinell Harriman in consultation with Carolynn Harvey, DVM. This article talks about how rabbits process sugar, protein and fibre.